Governments around the world have long since fully deployed global climate engineering on a scale that cannot truly be comprehended. They decided (without public knowledge or consent) that they had the right to use the atmosphere of our planet to serve their own agendas which amount to nothing less than weather and biological warfare. Chemtrails actually have a number of uses and applications. In a nutshell, we are being sprayed with toxic concoctions of heavy metals and other nasty substances. The chemtrail mixtures are dispersed by both mission-specific aircraft and by being mixed into the fuel used by commercial airliners and cargo planes. 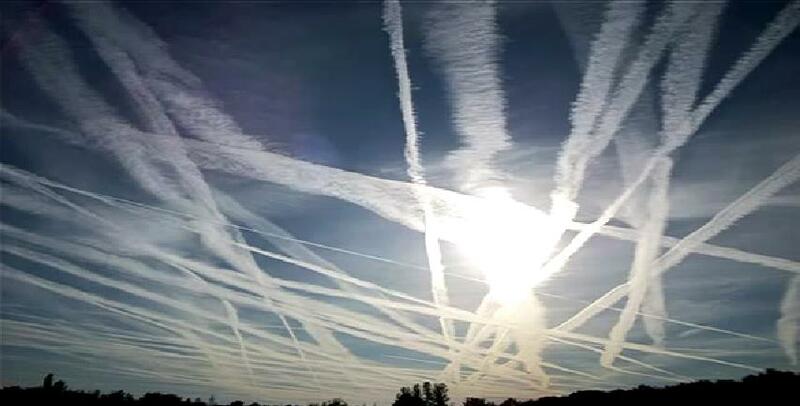 Chemtrails create an atmosphere that will support electromagnetic waves, ground-based, electromagnetic field oscillators called gyrotrons, and ionospheric heaters. Particulates make directed energy weapons work better. 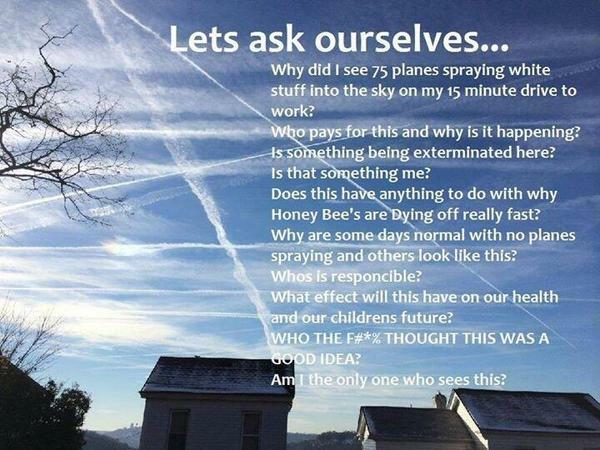 There is a difference between aerosol trails (Chemtrails) and condensation trails (Contrails). Aerosol trails linger, sometimes for hours and can spread out to form cloud-like material. Condensation trails from jet aircraft normally fade away within a minute. "I believe the chemtrails are responsible for a chemical intoxication of the public, which would then cause a general immune suppression, low grade to high grade, depending on exposure. The immune dysfunction allows people to become susceptible to opportunistic infections, such as this micoplasma and other opportunistic infections", I first began to investigate chemtrails when some were sprayed over my home in Northern Idaho. I took pictures of them, and then contacted the Environmental Protection Agency of the state who were clueless and referred me to the Air Force. They got me in touch with Centres for Disease Control Toxicology, and after about a week I received a letter from one of their chief toxicologists saying, indeed there was some amount of ethylene dibromide in the jet fuel says” Dr Leonard Horowitz, a former university medical researcher. Ethylene dibromide is a known human chemical carcinogen that was removed from unleaded gasoline because of its cancer-causing effects. Now suddenly it has appeared in the jet fuel that high-altitude military aircraft are emitting! “The Rockefeller family is one of the major players in this conspiracy. They are one of the major players in world genocide, world population reduction. That’s no mystery anymore. When you examine who owns the chemtrail fuel, who are the fuel company directors, suddenly you enter into the realm of the Rockefeller family and the royal families - Standard Oil and British Petroleum. Suddenly now you see their documents, showing that they have funded, historically, eugenics, racial hygiene, genocide, depopulation, family planning, maternal and child health - where they make and deliver vaccines, and contaminated blood supplies. These are the banksters, the same people who run the blood banking as well as the money banking industries", Dr Horowitz. On August 14th, 2015, there was a major event in Northern California that was organized for the purpose of exposing and halting the global climate engineering programs that are decimating our planet and the entire web of life. Numerous experts spoke out at this event including attorneys, former government scientists, a former defense industry technician, former military personnel, a prominent Northern California Neurologist, and a CEO for one of the largest environmental and engineering consulting firms in the world. Approximately 1000 people attended this event. Some planes have aerosol delivery devices along a large portion of the trailing edge of the wings, making it an impossibility for their wide trails to be mere condensation trails. See an example of this video below. Note also that the trail stops and starts, indicating that an aerosol delivery device is being turned off and on. Here is a more recent example of aerosol trails coming from the wings. This was from a twin propeller aircraft, named a Dash 8, that was filmed while flying over Christchurch, New Zealand and filmed by Aaron Duncan on June 6th, 2014. This evidence also clearly demonstrates that these substantial trails can not be condensation trails, as they are not emanating from the engines, but from the wings. “The federal government has invented an earthquake device. I am a geologist, and I know what I am talking about. With the Kobe earthquake in Japan, there was no pulse wave as in a normal earthquake. None. In 1989, there was an earthquake in San Francisco. There was no pulse wave with that one either.” Shortly after his lecture, Phil Schneider was found dead in his apartment with a piano wire wrapped around his neck. 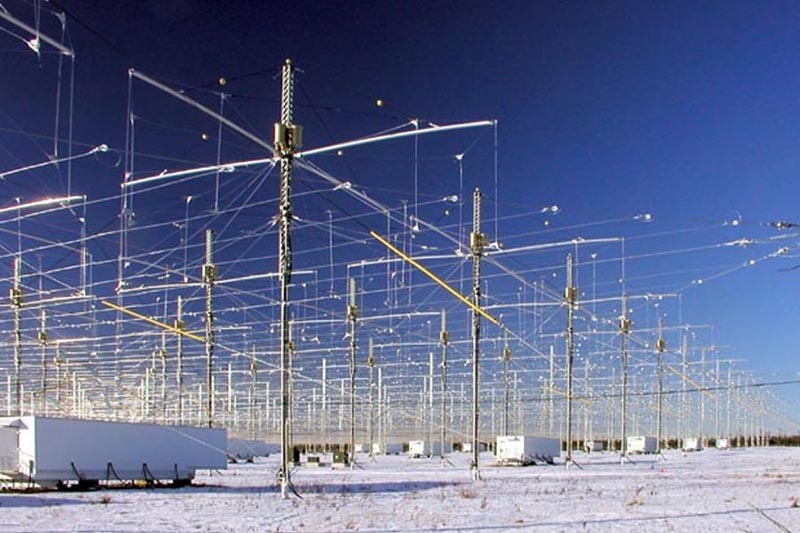 HAARP (High Frequency Active Auroral Research Program) is a little-known, yet critically important U.S. military defense project (in Alaska) which has generated quite a bit of controversy over its alleged weather control capabilities and much more. among which are mind, physical and economic control of the world. One of these projects takes placeat a military base in the wilderness of Alaska, northeast of Anchorage, near Gakona. This project bears the official name High-Frequency Active Auroral Research Program (HAARP). communications, electricity and electronic devices in selected areas. The experiments of HAARP projects also influence the migration of animals. Many dolphins, whales, sea lions and other mammals have died in the last few years. Of course the true cause of these massive deaths is not a consequence of disorientation or pollution of the seas. These sea mammals have a perfect sonar system that was disrupted by HAARP! same power as an atomic bomb but do not cause radioactivity. • Relocate or block jet streams, thus changing the weather of entire areas. • Artificially charge fault lines, causing earthquakes. electromagnetic network around the earth. In the last few years it was noted that, repeatedly, the jetstream actually moved from its normal position in the north to the south. The results of these shifts are natural disasters. Ever since HAARP started in 1994, there has been an unprecedented chain of natural disasters worldwide. Severe earthquakes, frequently occurring hurricanes, and sudden extreme changes in weather conditions all occurred within a short time span. When we think of climate disasters such as the “Tsunami”, “Katrina’, “Rita” and “Wilma” there is no such thing as coincidence. However meteorologists are not investigating the matter. HAARP can cause local disturbances by manipulating the atmosphere, causing disturbances that could never have been caused by natural weather patterns. A characteristic side effect of these same manipulations is that they can cause physical and psychosomatic symptoms in humans. Strong feelings of uneasiness and anxiety, gastrointestinal problems, headaches, migraines, irritated eyes and feelings of depression are typical symptoms of such manipulations. Intitute (AEI) make sure that economists and scientists keep their mouths shut. There are hardly any scientists among the members of the United Nations climate panel. Known scientists mostly depend on the elite behind the New World Order, and are generously rewarded for saying the things the Illuminati want us to hear, causing the truth never to be revealed. research center in the United States, and possibly worldwide, that is focused on climate change. Someof the world’s brightest scientists, also experts in solar physics and climate change, are working for the SSRC. A press release by SSRC confirmed recent announcements by NASA that there are historic and important changes taking place on the sun’s surface that will bring about the next climate change. have only a few years to prepare before twenty to thirty years of lasting and possibly dangerous cold temperatures arrive. Given the importance of the next climate change, Director of the SSRC John Casey was asked whether the government has been notified: “Yes, as soon as our research revealed these solar cycles and the prediction of the coming cold era with the next climate change, I notified all the key offices in the Bush administration including both parties in the Senate and House science committees as well as most of the nation’s media outlets. Unfortunately, because of the intensity of coverage of the United Nations Intergovernmental Panel on Climate Change (IPCC) and manmade global warming during 2007, the full story about climate change is very slow in getting told. These changes in the sun have begun. They are unstoppable. With the word finally starting to get out about the next climate change, hopefully we will have time to prepare. We will do our best to spread the word along with NASA and others who can see what is about to take place for the Earth’s climate. We are not being told that the poles are not melting and that the temperature on Antarctica continues to drop. The fact that warm regions, such as Miami, are experiencing snow and extreme cold along the Gulf Coast is being kept out of the news. A scenario of doom is being concocted to make us frightening and ignorant. In reality these climate changes are the result of the HAARP installations that heat the ionosphere with their gigantic antennas. Also, the cause of the monster waves on the North Sea and the unprecedented spring 2007 record-breaking heat wave (thirty-five degrees Celsius) in Moscow, and snow in Rio de Janeiro can be trailed back to HAARP. creating weather modification techniques that trigger storms, hurricanes and earthquakes to achieve military goals.Military documents talk about the intent to use the ionosphere for defense purposes. such as the regions of Iraq and Afghanistan. Antiskid layers would be applied over the tires and shoes of Defense personnel to prevent them from sliding on the ice. A chemical form of glazed frost? We must assume that the source of this chemical can be traced back to the HAARP project. With the aid of HAARP, rain has been caused in India some time ago and snow, glazed frost and thick layers of ice in Jordan and Iraq. 1.The temperature of the ionosphere has been raised by hundreds of degrees in these experiments. 2.A means and method is provided to cause interference with or even total disruption of communications over a very large portion of the earth. This invention could be employed to disrupt not only land based communications, both civilian and military, but also airborne communications and sea communications. This would have significant military implications. 3.It is possible ... to take advantage of one or more such beams to carry out a communications network even though the rest of the world's communications are disrupted. 4. [It] can be used to an advantage for positive communication and eavesdropping purposes. 5.Exceedingly large amounts of power can be very efficiently produced and transmitted. 6.This invention has a phenomenal variety of ... potential future developments. Large regions of the atmosphere could be lifted to an unexpectedly high altitude so that missiles encounter unexpected and unplanned drag forces with resultant destruction or deflection. Weather modification is possible by, for example, altering upper atmosphere wind patterns or altering solar absorption patterns by constructing one or more plumes of atmospheric particles which will act as a lens or focusing device. Ozone, nitrogen, etc. concentrations in the atmosphere could be artificially increased. 7.Electromagnetic pulse defenses are also possible. The earth's magnetic field could be decreased or disrupted at appropriate altitudes to modify or eliminate the magnetic field.